This deal is for one session of Cryo T Shock- Slimming, Toning or Fat Loss. Please call to make a reservation. Have you heard about Cryo T-Shock yet? It combines the power of cryotherapy and thermography to help you reshape your body. 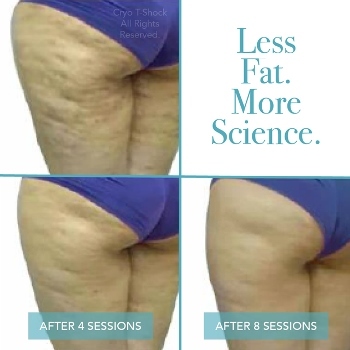 The Cryo T-Shock is the most innovative and versatile anti-aging device on the market to eliminate localized fat, reduce cellulite, as well as tone and tighten the skin. It also stimulates collagen and elastin production, and can take inches off that your workouts haven’t been able to! A painless and a non-surgical alternative to liposuction, Cryo T-Shock naturally breaks down and destroys fat cells and flushes them out through the bloodstream and lymphatic system. It helps improve areas like stomach and love handles, buttocks, double chin, thighs, or underarms. It’s used in the best spas in Europe and now it’s arrived at Blu Ice Cryo Spa!